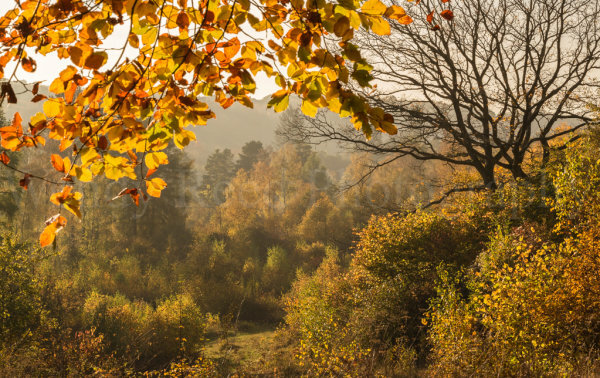 At Warburg Nature Reserve the mixed planting results in a glorious autumn of yellows and golds. This is one of my favourite viewpoints in autumn because of the mix of evergreens and deciduous trees. On this particular late afternoon as well as the oranges and caramels of the beech leaves in the foreground there were glowing yellows contrasted with the dark skeleton of a tree that had already shed its leaves and in the background beautiful amber larches. Warburg Nature Reserve is where the tarmacked road through Bix valley ends and meets a bridleway. It is a lovely place to visit at any time of the year and has a visitor centre and bird hide.